A combination of inventive genius and forward-thinking entrepreneurs laid the foundation of a diverse industrial economy in Worcester after 1825, overcoming the geographic isolation and lack of waterpower that made an unlikely place for an industrial city. The Blackstone Canal linked Worcester and Providence in 1828, and the railroads first opened Worcester and Boston in 1835. The transportation improvements made Worcester a crossroads and offered the possibility of large-scale manufacturing for distant markets. Local entrepreneurs Stephen Salisbury II and William T. Merrifield began to build factories and to rent space with power to new manufacturers. 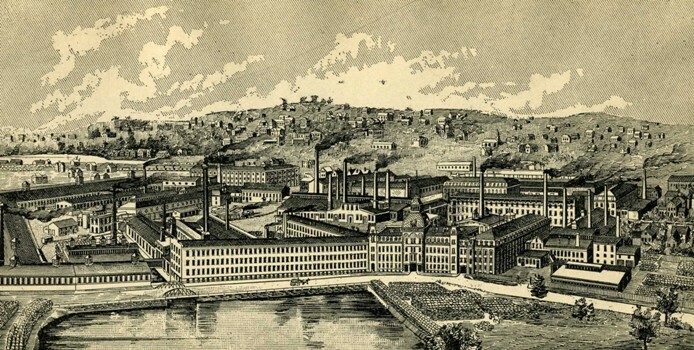 These factories were a major reason for Worcester’s growing diversity as well as its climate of innovation. They made it possible for mechanics to go into business cheaply and created an environment that encouraged risk-taking. Many skilled workers took advantage of the opportunity to start small firms of their own after periods of training in local shops. The result of my building mills is thus far very satisfactory for while I am content with the rent, the tenants deem it very favorable and both mills are filled with good business. The mechanics in these mills work for a certain number of hours and it is therefore important that they should live within a reasonable distance. I have therefore had many solicitations for houses, especially near the Grove Mill at the north which employs 50 men. In the last year I built 4 houses and refitted another near this mill which accommodates 7 families and there are at least as many more who wish for houses. Connected with extensive lines of railway, our wares of every description readily find their way to the remotest part of the republic; and today, wherever, on our frontier settlements is heard the crack of a Worcester rifle, tomorrow will be found the plows and hoes, and the thousand an done implements of husbandry, of Worcester manufacture, preparing the way as they advance, for the numberless things of Yankee device, the product of our workshops. Worcester came of age as a truly industrial city in the forty years after the Civil War. The population swelled from 50,000 to 118,000 as the number of workers and the value of their output doubled, Worcester mechanics grew famous for their machine tools, wire products, and power looms. Woodworking and metalworking machines were made in large numbers by Worcester companies in this extremely dynamic part of the local economy. Skilled machinists frequently started new companies after years of training in local establishments, creating a Worcester “family tree” of machine tool firms. The mechanization of work and the development of large factories created a new working class and new social relations. Class and ethnic divisions in residential patters emerged as East Side and West Side took on new meanings. Thousands of “three deckers” were built as a distinctive local solution to the housing needs of the growing working-class population. The foreign-born and their children came to outnumber the native-born as large numbers of them arrived to work in local industry.